Attractive – Clean lines are provided and the unsightly dated key and push button type mechanism is eliminated making way for the handle to be easily cleaned. 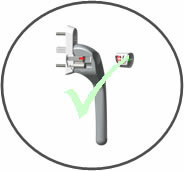 Fast Release – This is enhanced through the handle’s lock release fob key [pictured left], which replace the out dated notch and groove type key. The magnet key fob once placed on the handle’s contoured front plane immediately unlocks the handle and the LED system completes an in internal circuit which turns on a flashing green light to alert you to the fact that the handle is unlocked. Secure – The handle’s automatic locking feature together with its magnetic personal key location cradle helps to encourage the locking of windows. Strong – By eliminating the traditional multipart mechanism the Fastlock™ handle is able to incorporate the first unbreakable twin-barrelled locking mechanism. User Friendly – The ergonomic design is particularly helpful to the elderly and people with arthritis or limited hand motion. It also benefits the visually impaired because there is no longer a conventional tiny key slot to target. A special holder is available for the key fob if required that makes handling even easier.